Fine Living assists with a variety of real estate needs including investment properties, annual/seasonal rentals, townhomes, downtown living, and neighborhoods with no HOA fees. No wonder why many are choosing to invest in a city so widely commended for its glorious weather and beaches. Palm Beach has become one of the top travel destinations with its array of activities consisting of fishing, boating, golfing, surfing, and so much more! Want more at night? The area’s leading restaurants and lounges are located both in Downtown at the Gardens and West Palm Beach. This city is home to the restless, activity seeker as well as the quiet, beach lover. 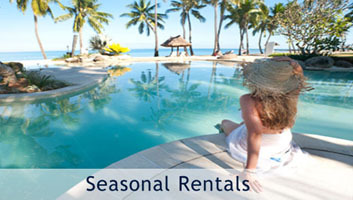 Please contact our office for a list of seasonal rentals available.